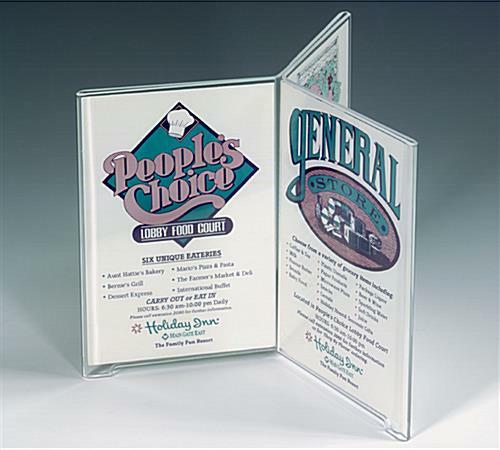 This menu holder is a popular display used within restaurants, hotels and other commercial establishments. 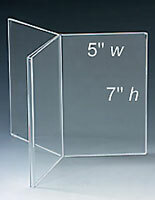 The frame is made entirely of acrylic for a clear view of the entire graphics. Each menu holder, table tent, can hold up to six different images. Users can configure this multi-panel display to suit their needs. 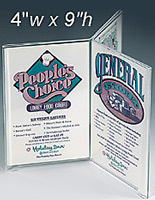 This menu holder, also known as a table sign, has 3 panels that each hold a 4" x 6" graphic. This common size makes it easy to change signage at a moments notice. 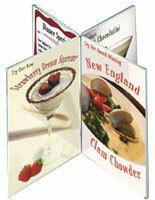 This menu holder is typically used to display dessert options along with wine listings or current promotions. Hotels often use this sign display in guest rooms to display TV channels or room service options. 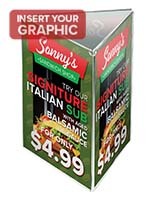 This menu holder is easy to change out graphics. The top and bottom feature openings where the images slide in and out. 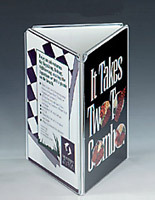 Each menu holder, also known as a sign display, feature 1/4" high feet that raise the unit away from the table surface. This convenient option prevents the signage from absorbing liquids from spills and cleaning normally associated with a restaurant. 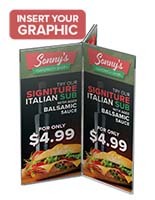 This multi-panel sign frame is the ideal menu holder for dining facilities with limited tabletop space. Cleaning this table sign is as easy as wiping it with a damp cloth. 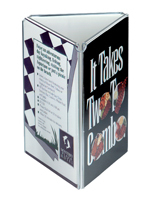 This menu holder is available in several other sizes and configurations in this online catalog. These tabletop sign holders are excellent and sit in my office's conference rooms, displaying our core values for all to see. Sturdier than plastic picture frames. 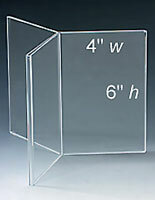 I ordered a handful of these to replace a different brand for my table top menus. 2 of them were "molded" together in the center section so I couldn't get them apart to get the menus inside. One quick call to customer service and I was told to throw the bad ones away and 2 replacements were on the way! EXCELLENT SERVICE AFTER THE SALE! The best part about these is that they have little feet on the bottom to serve as legs to keep them elevated, so the menus won't absorb any liquid that may be spilled on the table around them. My only issue is that there isn't a little tab on the bottom of the center section of the display to support what is in the display so the items don't drop down and through the bottom-- which defeats the purpose of the feet. This could be modified with a tiny piece of clear tape in on the bottom, though. Hi Kristy, Thank you for your review.